In 2004 the 30th Anniversary Special Edition emerged, nicely packaged and presented on a single disc, but with very little extras. In February 2011, after a gap of seven years, an updated DVD version of Dark Star, called the Hyperdrive Edition, emerged. It was well overdue because it was by far the most definite version. It was over two discs, and incorporated more than three hours of additional features. The film was sourced from a new 16 x 9 35mm transfer, with frame by frame digital restoration of the video master to vastly improve the resulting picture. The soundtrack was also digitally enhanced and restored to Dolby 5.1. If it looks like I’m reviewing an old disc, it’s because, generally speaking, I am. This Blu-ray edition is on one disc rather than two, but aside from the brighter picture you would expect from this medium, the release is little different. Let There Be Light: The Odyssey of Dark Star, is an almost 2-hour length documentary which explores the four year journey from conception to theatrical release. With John Carpenter’s main partner on this project, Dan O’Bannon, sadly no longer with us, you would expect there to be a lot of Carpenter material. Although the documentary is very thorough, the vast majority of the reminiscenses and anecdotes are told by O’Bannon’s widow and Brian Narelle, who played Lt Doolittle. There are audio recordings from an old Carpenter interview, but there are no accompanying pictures of the man himself, and the recording is subtitled due to the sub-standard quality. Dark Star was first released in 1974, 38 years ago, so I suppose like any old film it becomes increasingly difficult to find people to dig for recollections. Plus the fact that some people just don’t want to be reminded of their past. The biggest disappointment, extras-wise, is that there is no audio commentary to accompany the film by John Carpenter. For a huge Carpenter fan like myself this is a major oversight. I find his other film commentaries highly entertaining He is not afraid to be self-deprecating and tell his audience what didn’t work, and there is normally a great deal of insight and information surrounding the process of filmmaking. They really should have made it worth JC’s time, as it would have rounded off an almost perfect release. 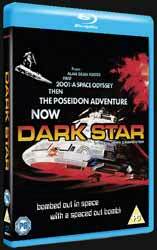 I say almost, because although everything looks very pristine, there are some extras on the DVD version which are not present here - including the highly entertaining interview with SF writer and Dark Star novelist Alan Dean Foster. Instead, we have two versions of the film: the Director’s Cut and the Theatrical Release (for which there is 15 minutes additional material). And now to the film itself. This should be on every Carpenter/O’Bannon fan or historical film collector’s shopping list. As far as the casual mainstream viewer (or even SF fan) goes, you’ll be sorely disappointed if you’re expecting a big Hollywood production with spectacular stunts and special effects. This began as a student project while John Carpenter was still at film school. With help he was determined to see it through to a theatrical release. Even then it took four years, primarily because he kept running out of money. Consequentially, it was released on a shoestring budget. The film has been described as a parody of Stanley Kubrick’s 2001: A Space Odyssey, but present day parodies are blatant comedies. This is closer to dark humour; it’s quirky but there are no laugh-out-loud moments, except perhaps the celebrated feeding the alien sequence. I tend to regard this as a valuable piece of nostalgia. It’s highly entertaining without being exciting. Of course John Carpenter went on to great things, such as Halloween, Escape From New York, Assault on Precinct 13, The Thing, and many others. But let’s not forget where he came from. This is the most comprehensive release of Dark Star thus far. The picture is phenominally crisp (earning half the points alone), and the menus are nice.